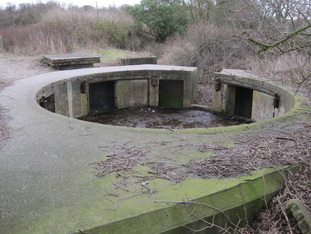 An anti-aircraft battery usually consisted of an emplacement for guns designed specifically to target aircraft. 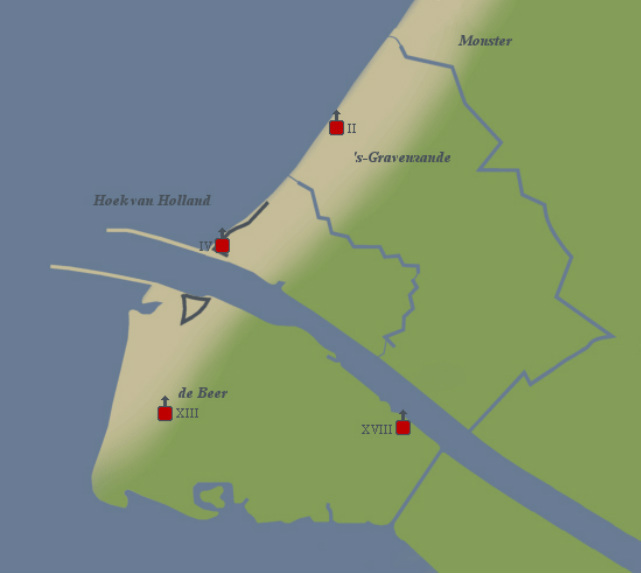 There were four heavy anti-aircraft batteries in Hoek van Holland, two to the south of the estuary (XIII and XVIII) and two to the north of the estuary (II and IV). These four batteries each had disposal of four type SKC/32 10,5 cm anti-aircraft guns. Each gun was covered by a 1,5 cm (3/5 inch) thick steel dome. Directly north of the estuary lies Marine-Flak-Batterie Nordmole (naval anti-aircraft battery ‘northern pier’). This battery and the military administrative area that it’s in (Stützpunkt IV), consists of about 50 Dutch and German buildings. A massive 2 meter (6,5 feet) thick anti-tank wall was constructed along and beyond the western perimeter of this area, covering about 1,5 kilometres (approximately one mile) of coastline. The museum conducts guided tours in this area. Click here for more information about the guided tours. One of the four remaining gun emplacements of anti-aircraft battery Nordmole.